My Ultimate Banana Bread recipe keeps well! Although it’s not the end of the week for baking the weekend treats, I took advantage of buying a one dollar banana bag of over ripe bananas to take home. By the time I finished sorting through this bargain, I had enough for the family to snack on plus four small banana breads to put in the freezer by making my Ultimate Banana Bread recipe! My Ultimate Banana Bread is my favorite recipe when it comes to dealing with making anything like banana bread or cake since it’s easy and so moist. Truly, this is the only one I make these days because of all the recipes I tried, this definitely is the best. The recipe is simple and makes either four small loaves, two regular loaves, or a tube-pan size cake like a typical angel food cake. By the way, I suggest the next time you see one of those discounted bags of bananas to weigh it on the fruit scale because you might be surprised. The typical bags I bought weigh in on an average of four pounds for that dollar, which is quite economical! I do hope the next time you decide to do something with your bananas that you will want to try this delicious Ultimate Banana Bread recipe of mine. You won’t be disappointed! You can alter the flavor of this recipe by substituting one cup of white flour for one cup of Great River Organic Milling Company Whole Wheat Flour that is currently on giveaway. This also makes a scrumptious treat. Measure out your sour milk and stir in your baking soda. In your mixing bowl, add your canola oil and sugar and beat with your electric mixer until well combined, then add the eggs one at a time to beat in thoroughly. Next add your sifted flour, baking powder, salt, and cinnamon and alternate with the milk and soda mixture until everything is well mixed. Grease whatever loaf pans or tube pan you choose. 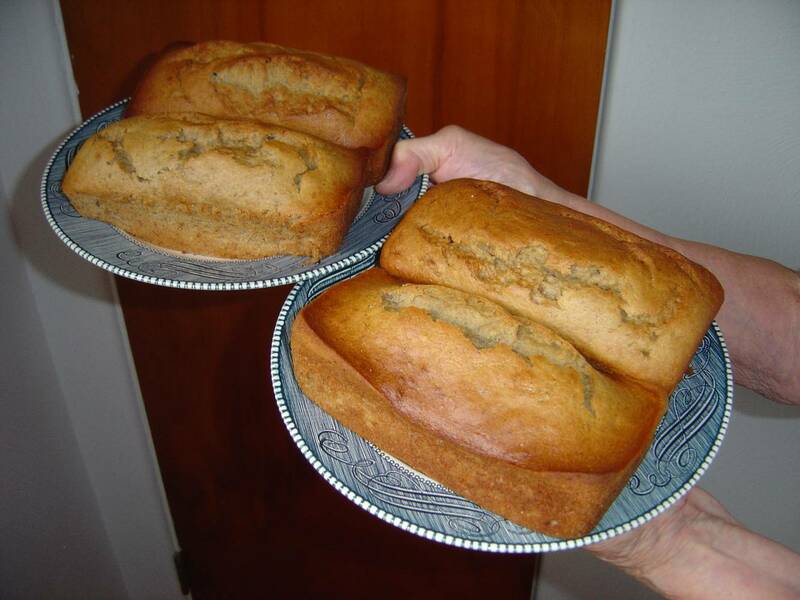 For the four small loaves pictured, I used sizes about 7-3/8″ x 3-7/8″ x 2-1’4″. Bake at 350 degrees for about 55 minutes or until a toothpick inserted in the center comes out clean.